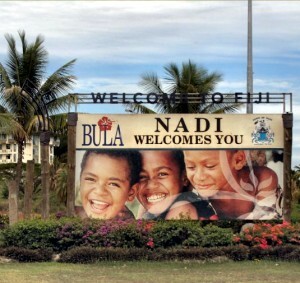 Nadi (pronounced Nandi) has a population of around 43,000 and is the tourism hub for travellers to Fiji. Located on the western side of the main island of Viti Levu, Nadi is constantly on the go and never seems to sleep with its jam-packed streets, hot climate and friendly local people. The Main Street in Nadi is the commercial centre of the town and is brimming with all types of different shops. The competition to get you to buy something is fierce with many street touts offering you all sorts of things at cut rate prices. Combine this with the shop entrance loudspeakers playing the latest Hindi or Fijian music and you have a fantastic cacophony of sound, sight and colour. Nadi doesn't have fabulous white sand beaches (for that you have to go to the Mamanuca or Yasawa Islands). What it does have is the largest range of accommodation in Fiji including hotels, motels, backpackers and hostels. There are also plenty of restaurants with a complete range of local and international culinary delights available in Nadi town itself or in the satellite towns of Martintar or Namaka. Nadi also has some great nightclubs, an 18-hole golf course near the Nadi Airport and is the centre for Hinduism and Islam in Fiji, boasting the beautiful Sri Siva Subramaniya temple. The Nadi market is defintely worth a visit with cheap locally made handicrafts and other assorted items available. The Nadi International Airport is conveniently located just 9 kilometres north of the Nadi township. The airport is the main point of entry for nearly all visitors to Fiji as flights from numerous countries land here, including a number of the major cities on the Australian east coast, major New Zealand cities, Los Angeles, Tokyo, Vancouver & Honolulu. Getting from the Nadi International Airport to the town by taxi is easy and cheap. All rates are 'from rates' only, quoted in $AUD and are inclusive of all taxes. You can click here to see all Nadi Rates & Availability. The Hexagon Hotel & Villas is an extremely popular budget Nadi accommodation which many holiday makers use for staying in the city before or after they make their way to some of Fiji's outer islands. There is a choice of deluxe hotel rooms or 2 bedroom villa resort accommodation, allowing other travellers to use this Nadi accommodation as a central travel base from which to explore the mainland of Fiji. Each of these budget accommodation units has a balcony which overlooks either the brand new swimming pool or the tropical gardens. At the Grand West Villas guests can enjoy their very own private retreat in an elegant atmosphere. The friendly staff at the Grand West Villas in Nadi can help you with any travel tips that you may need where touring around Fiji. This Nadi accommodation is ideally located only 10 minutes from the Nadi International Airport and Nadi town centre, whilst the Nadi Bay beach, Nadi Airport Golf course, sea plane and Boat Club are just a short 6 minute walk away. The Capricorn International Hotel is the perfect place to start your Fiji holiday experience. This budget Nadi accommodation is ideally positioned close to 6 different restaurants, cafes, the Nadi shopping centre and even the Nadi Bay. The helpful staff at the tour desk will be glad to organise anything for you including island day trips and tours to the Garden of the Sleeping Giant. In the evening you can make new friends during happy hour or enjoy a quiet moment in the outdoor lounge bure at the Capricorn Hotel Nadi. The First Landing Beach Resort & Villas is nestled amidst magnificent tropical gardens and is a small, owner-operated resort featuring one of the South Pacific's premier restaurants. At the First Landing Beach Resort all bures and the beach face due west, giving breathtaking sunsets across the Pacific and nearby islands. The staff at the First Landing Beach Resort and Villas pride themselves on providing personalised service and genuine hospitality that will ensure that your stay is a memorable one. If you want hotel and/or resort accommodation in Nadi at cheap rates for your next holiday then Holidays Fiji is the place for you. We give holiday travellers the ability to compare a range of hotels, resorts and apartments at the same time, thus making it easier for you to decide where it is that you want to stay. The accommodation on Holidays Fiji ranges from luxury beach front resorts and honeymoon suites through to budget backpacker rooms and family friendly apartments. So book your accommodation at any of the Nadi resorts with confidence, and even take advantage of the cheaper rates for longer stays.